... so I had to, too. Can you learn all you need to know about Graphic Novels by reading just two books? If one of them is mine, then the answer is yes—yes you can. Absolutely. But since I was a kid, I haven't been into comic books very much, so when people ask me to recommend a good graphic novel I find myself offering up one of two choices. Choices that have only one thing in common--mice. Both comics have mice as the main characters. Baby Mouse is by Jennifer (writer) and Matthew (illustrator) Holms. Baby Mouse is fun, funny and just wants straight whiskers. Most of us can identify with Baby Mouse. This series is aimed at the younger set--3rd and 4th graders but if you pick up a copy, I promise you that you will enjoy it. The other end of the spectrum is Maus: A Survivor's Tale by Art Speigelman. Maus recounts the story of Speigelman's father during the Holocaust. In 1992 it won a Special Pulitzer Prize Award--that is how good it is. For some reason graphic novels are very good at tapping into our raw emotions and bypassing the analytical mind. Maus hits hard and is extremely powerful. Read this one when you need a dose of humanity. New York (July 26, 2008) - United Media (UM), a leading licensing and syndication company announced today the addition of the critically acclaimed Babymouse series from creators Jennifer L. Holm and Matthew Holm to its current portfolio. Effective immediately, UM will assume agency representation for Babymouse merchandise and work with the creators to develop a comprehensive program in the U.S. and Canada. This program will target 6 – 11-year-old girls, as well as older girls who are young at heart. Initial focus will be on apparel, accessories, stationery, gift, back-to-school, interactive, toy, and craft. With eight titles currently in the market and an additional two titles planned for release each year going forward, the Babymouse graphic novels have quickly cultivated a loyal following among young readers, parents and educators alike. Babymouse is available wherever books are sold. “It’s incredibly exciting to be working with the people who bring Peanuts to the marketplace,” said Jennifer Holm, who, along with her brother Matthew, is the co-creator of Babymouse. "We're tickled pink to be in such terrific company!" Babymouse lives in two worlds. In her day-to-day existence, she longs for excitement and travel. What she gets are dodgeball games, a recalcitrant locker, and garbage detail at home. In her dream world, though, Babymouse assumes secret identities, solves mysteries, and generally wins the praise and adulation of her peers. Babymouse has an active imagination, one that frequently gets her into tough situations at school and at home. Somehow she manages to triumph by the end of each story and stay true to herself. For more information visit www.babymouse.com. Jennifer L. Holm is a two-time Newbery Honor winner and a New York Times bestselling children’s author. Jenni loved reading as a child and would even rake the lawn while reading a book. She won a Newbery Honor for her first novel, Our Only May Amelia, which was inspired by her father's family stories. She is the author of several other highly praised novels, including the Boston Jane trilogy, and Penny From Heaven, which won a Newbery Honor in 2007 and was a New York Times bestseller. Matthew Holm is the co-creator of the Babymouse series of graphic novels from Random House Children’s Books. He is also a professional graphic designer and the Consulting Creative Director for Hot Knife Design, Inc., of Boston, Mass. Prior to working on Babymouse, Matt spent eight years writing about kitchens (among other topics) for Country Living Magazine. He currently lives in Portland, Ore., with his wife and dog. United Media is a worldwide licensing and syndication company that focuses on building brand equity around a wide range of creative content. The company recently partnered with HISTORY, the award-winning cable network, as the exclusive merchandise licensing agent for the brand and its acclaimed programming that includes the popular Ice Road Truckers series. United Media licenses and/or syndicates other properties, including Peanuts, Hallmark’s hoops&yoyo and Maxine, Dirty Dancing, Televisa’s El Chavo, Deadliest Catch, Raggedy Ann & Andy, Precious Moments, Dilbert, and Fancy Nancy. United Media is an E. W. Scripps Company. For more information, visit www.unitedmedialicensing.com. Well, not the podcast so much as the RealAudio and Windows Media stream. In any event, if you missed Jenni's appearance on the Diane Rehm Show last week, in which she and the other guests discussed Anne of Green Gables, then you can catch it now at this link. (Click on "Listen to this segment" on the right of that page.) Amusing in light of the recent Anne of Green Gables/No Strong Heroines flap. Well, at least SOME mothers aren't up-in-arms about the proliferation of filthy, dirty, disease carriers. Babymouse. Or rather, Babymouse! Lover of cupcakes and books! Master of living inside her own head, because it is so much more interesting and exciting than dull old everyday reality! Cartoon heroine for the ages! Or at least, for about ages 6-9, especially those who like graphic novels. By Jennifer and Matthew Holm. The killer cake (sculptural cupcake?) 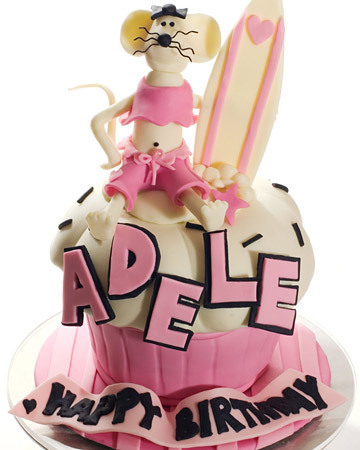 was created by Bethann Goldberg of Studio Cake in Menlo Park, Calif. The Children's Museum of Indianapolis is running a year-long exhibit (through May 3, 2009) called Comic Book Heroes. We gave them some Babymouse materials and commentary to use in the exhibit, and I see that it was put to use in the exhibit's teachers' study guide (PDF). It has a couple of nice lessons, so I'll be adding this to my TLA resources page, too. I came across (via Google News Alerts) a couple of Babymouse mentions online. Claire Jones is 9 years old and will be in fourth grade at Lakeview School. Her parents are Brady and Wendy Jones and she has two brothers Ben, 13, and Daniel, 11. She has a dog named Buddy and her favorite things to do are paint and shop. 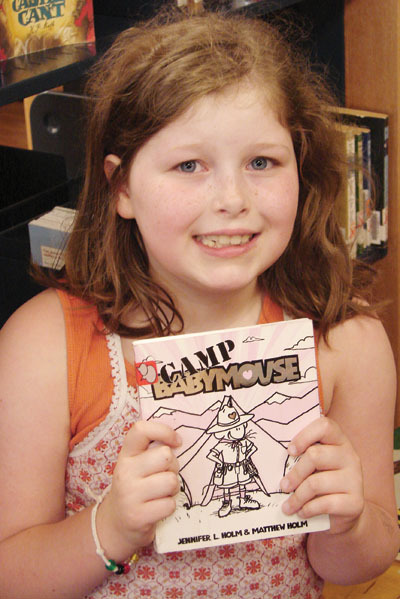 Her favorite book is “Camp Babymouse” by Jennifer and Matthew Holm. She likes the whole series because the books are funny and have good stories in them and she likes the authors. How funny - our mom tagged us! Even though she already knows all this stuff about us, she thought it would be nice if we shared this with our readers. And we thought she was the only one that read our blog! 3. Babymouse series books are my favorite - the books are about a middle-school aged mouse named "Babymouse", and she loves cupcakes, surfing and reading. Cooking with the Kids finally led me to the site Cupcake Hero. It's like Iron Chef, only with cupcakes. Check out the dee-lish-looking recipes. ... um, in a book, that is. ... Graphic novels have become very popular, and there are many different series available now in both the children's and YP areas. Some popular titles include: Megaman NT Warrior; Hardy Boys, Undercover Brothers; Nancy Drew, Girl Detective; Bone by Jeff Smith, Amelia Rules by Jimmy Gownley, Babymouse by Jennifer Holm and Goosebumps Graphix by R. L. Stine. Since I see that the Kidlitosphere Conference is taking place a scant few miles from my house, I guess I can't help but go. To be honest, it'll be a nice change to go to the airport without a 12-hour transcontinental travel day involved. My sister, Jenni, is going to be a guest on the Diane Rehm Show next Wednesday, July 23, 2008 (11am ET). The segment is about Anne of Green Gables; Jenni, who wrote an introduction to an edition of Anne of Avonlea some years ago, will be discussing how the book influenced her own writing. Erika Irwin of the Ohio-based paper The Akron Suburbanite mentions Babymouse as a good choice for summer reading in her article, "A summer fun reading list:"
... A new trend in books that may help reluctant readers is the graphic novel. Children’s librarian Jen Welsh at the Lake Branch of Stark County Library has a display of the books available. Many books such as the Babysitters Club by Ann M. Matthews and Goosebumps by R.L. Stine are now available in comic book form. A new series entitled Baby Mouse by Jennifer Holm and Matthew Holm is also very appealing.